Advantage Command Center is a better way to manage and track your telecom data. Managing the vast and dynamic information about your Cloud and telecommunications infrastructure and services is difficult. Spreadsheet solutions are inefficient, time consuming and fundamentally limited in what they can do. That’s why we developed Command Center, the next generation of our proprietary software platform for management and visibility of, as well as archiving and reporting on, your telecom data. We keep your data accurate, up-to-date and centrally organized. And, thanks to our SaaS delivery model, all of your data is easily accessible from anywhere you have an internet connection, via an online branded portal. Fully managed by our expert team of project managers and customer care specialists, we build and maintain an up-to-date and accurate repository of the complete array of your telecom services. Then, our software enables fast and easy access to all of the information you need to report service issues or total outages, either to our team or directly to the service provider. We make trouble ticket creation and tracking as simple as possible. Effortless to access and export your infrastructure information by location, service, or provider, our system includes filtering capabilities that enable efficient, pinpoint retrieval of whatever detailed data you need. Further, your inventory includes all services, globally, across all providers. We even store your provider service agreements in our contract management module, which encompasses search capabilities, exporting and agreement expiration tracking to avoid unwanted auto-renewals. And, our software provides automatic alerts for items requiring your attention such as trouble ticket updates, installation milestones and upcoming termination dates for provider agreements. We maintain a complete history of trouble tickets, service orders, provider contracts and addendums, and pricing exercises. With either a few clicks or a request to our team, you can quickly and easily view, sort and export critical historic information. 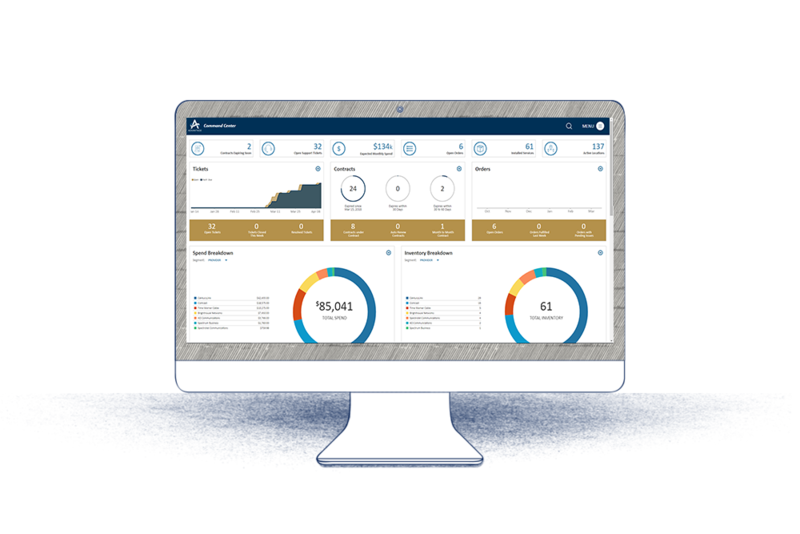 Our custom reporting tool enables near effortless creation of reports about specific types of services, such as internet access, or about an office location, or even about a specific provider. Or, combine search criteria for more granular investigation. Next drill down into details of interest, such as monthly cost for services, port or loop size, circuit numbers, demark location, IP addresses, etc. Then, export the data and print to take to meetings or send to colleagues for review. Finally, a global access point across all providers and services, managed and updated by our team. Automated alerts for items requiring your attention. Custom reporting, down to a granular level, on all of your services, globally. All Advantage customers have access to Command Center at NO ADDITIONAL COST.